Railpictures.ca - Unknown, Dan Dell'Unto coll. Photo: White smoke gently puffs from her stack as CP S3 switcher 6540 idles outside the yard office at Lambton Yard on a cold December morning while awaiting her next assignment. She was one of a handful of Alco/MLW S-series switchers that worked the Toronto area switching yards and working the local freights that served industry located along the lines. Many of CP’s switchers ended up spending most of their lives assigned to and working in one area or region, and according to photos and assignment sheets 6540 was one of the longtime local gals that spent most of her life assigned to John Street Roundhouse downtown, where CP’s 539-power was serviced and maintained for the Toronto area. The non-turbocharged 660hp S3 model was favoured by CP in the latter part of dieselization due to lower maintenance costs (no turbo) and also what CP deemed an adequate amount of power for most switching activities (for those that required more, CP employed its already-numerous 1000hp S2 units). As time went on, the aging switchers were found to be underpowered for the increasing train and freight car weights. Some were MU’ed together for heavier tasks at various terminals (including flat-switching at Toronto Yard), while others were gradually retired and sold off to industries, shortlines or for scrap as larger power replaced them. 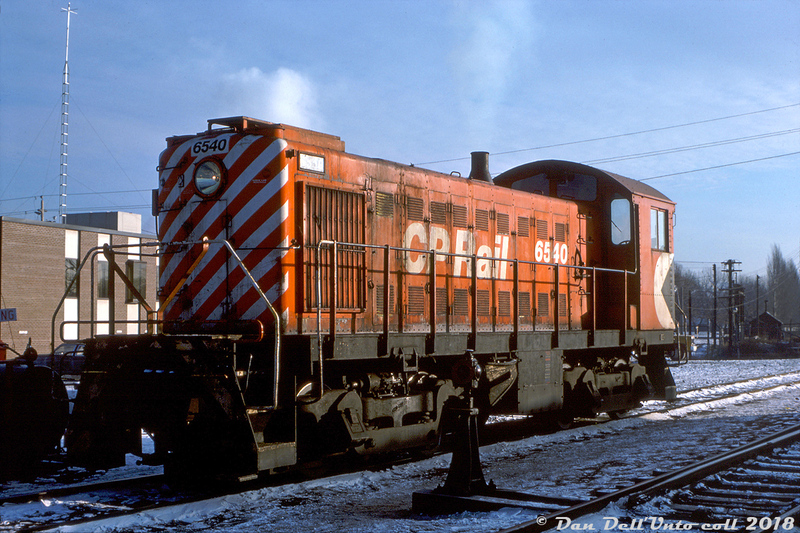 Some like 6540 clung on to yard and local assignments into the 1980′s until what remained of the old 539-powered switcher fleet was finally retired and replaced by more powerful rebuilt GMD units (6540 was retired in January 1983, and scrapped at CP’s Angus shops in Montreal). Original photographer unknown/not noted, Dan Dell’Unto collection slide. | Railpictures.ca – Canadian Railway Photography – photographie ferroviaire Canadienne. Copyright Notice: This image ©Unknown, Dan Dell'Unto coll. all rights reserved. Caption: White smoke gently puffs from her stack as CP S3 switcher 6540 idles outside the yard office at Lambton Yard on a cold December morning while awaiting her next assignment. She was one of a handful of Alco/MLW S-series switchers that worked the Toronto area switching yards and working the local freights that served industry located along the lines. Many of CP's switchers ended up spending most of their lives assigned to and working in one area or region, and according to photos and assignment sheets 6540 was one of the longtime local gals that spent most of her life assigned to John Street Roundhouse downtown, where CP's 539-power was serviced and maintained for the Toronto area. The non-turbocharged 660hp S3 model was favoured by CP in the latter part of dieselization due to lower maintenance costs (no turbo) and also what CP deemed an adequate amount of power for most switching activities (for those that required more, CP employed its already-numerous 1000hp S2 units). As time went on, the aging switchers were found to be underpowered for the increasing train and freight car weights. Some were MU'ed together for heavier tasks at various terminals (including flat-switching at Toronto Yard), while others were gradually retired and sold off to industries, shortlines or for scrap as larger power replaced them. Some like 6540 clung on to yard and local assignments into the 1980's until what remained of the old 539-powered switcher fleet was finally retired and replaced by more powerful rebuilt GMD units (6540 was retired in January 1983, and scrapped at CP's Angus shops in Montreal). Original photographer unknown/not noted, Dan Dell'Unto collection slide.